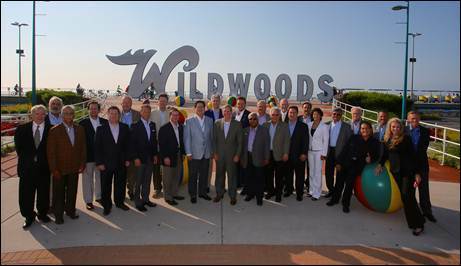 Nearly 30 of the amusement park industry’s top leaders from 14 nations around the globe gathered at the Wildwoods Convention Center and Morey’s Piers & Beachfront Waterparks in the Wildwoods, NJ for the annual International Association of Amusement Parks and Attractions (IAAPA) Board of Directors meeting June 24-27. Hosted by 2013 IAAPA chairman and second generation partner of Morey’s Piers, Will Morey, the four-day summit was the first board meeting known in its nearly 100 year history to be held in New Jersey and included executive meetings, site tours and visits to parks along the Jersey coastline. As IAAPA chairman, Morey represents the industry’s leading trade association with more than 4,500 facility, supplier and individual members from 97 countries. By latest estimates, revenues for the global theme park industry are $24 billion with attendance numbers exceeding 770 million. The market in the US comprises roughly half of that with annual revenues of $12 billion and attendance of 300 million. Members in attendance represented organizations such as Walt Disney Parks and Resorts, Universal Parks and Resorts, Nicco Parks (India), and the Jumeirah Group (UAE), as well as independent and family-owned parks including Europa-Park (the largest park in Germany), Enchanted Kingdom (Philippines), Fantasilandia (Chile), and the Jersey Shore’s own Morey’s Piers. The meeting was a particularly important one for the association in that the board agreed on a new global governance structure to be initiated in 2014. Morey, who chaired the Governance Task Force, was thrilled to have an issue of such international importance decided here in the Wildwoods. During his tenure as chairman, Morey has traveled to more than seven countries to visit parks and attractions that range from Ski Dubai (the Middle East’s famous indoor ski facility) to Resorts World in Singapore, as well as parks in Chile, Brazil, Phillipines, Indonesia, and Colombia. This summer and fall, Morey will complete his 2013 term with visits to Puy du Fou and Futuroscope parks in France, and several other domestic attractions across North America with an emphasis on family owned and operated facilities. Morey’s Piers, located on the boardwalk in the Wildwoods, New Jersey is a classic seaside amusement park, family owned and operated since 1969. Voted Top 3 for Best seaside amusement park in the world by Amusement Today, Morey’s Piers has over 100 rides and attractions spanning over eighteen acres along six beach blocks and includes three amusement piers and two beachfront waterparks. Convenient to the major population centers of the Northeast, yet a world apart, Morey’s Piers along with Morey Resorts combines the pure joy of an amusement park, the sights and sounds of a classic boardwalk, outstanding accommodations, together with the rhythm of beach life. Visit them at Surfside Pier, featuring the Ocean Oasis Waterpark and Beach Club at 25th Avenue, Mariner’s Landing Pier, featuring Raging Waters Waterpark at Schellenger Avenue, and Adventure Pier at Spencer Avenue. For more information, visit www.moreyspiers.com or phone (609) 522-3900.